Tesla has opted to step back from the ongoing NTSB investigation into the fatal Model X accident last month near Mountain View, CA. According to Tesla, it has decided to withdraw from its party agreement with the NTSB because it might result in withholding information that affects public safety. In an emailed statement to Bloomberg, the Elon Musk-led electric car maker stated that it believes in transparency. “Tesla withdrew from the party agreement with the NTSB because it requires that we not release information about Autopilot to the public, a requirement which we believe fundamentally affects public safety negatively. We believe in transparency, so an agreement that prevents public release of information for over a year is unacceptable,” Tesla stated. Despite not being a formal part of the ongoing NTSB investigation, Tesla stated that it would continue to provide technical assistance to the agency as it continues its probe into the tragic accident. Citing a person familiar with the matter, Bloomberg stated that the NTSB is actually removing Tesla from the investigation. Quite unlike the “very constructive conversation” reported by an NTSB spokesman last weekend between Tesla CEO Elon Musk and NTSB Chief Robert Sumwalt, the anonymous Bloomberg source stated that the talk involved Sumwalt informing Musk that his company was being taken off the investigation. The source further claimed that the conversation between Musk and the NTSB chief was “tense” due to the Tesla CEO’s reaction to the agency’s decision. Tesla’s decision to release information related to the NTSB’s ongoing probe resulted in the agency stating that it was “unhappy” with the electric car maker. Responding to the NTSB, Musk stated on Twitter that Tesla will immediately release information that can directly affect public safety. “Lot of respect for NTSB, but NHTSA regulates cars, not NTSB, which is an advisory body. Tesla releases critical crash data affecting public safety immediately & always will. To do otherwise would be unsafe,” Musk tweeted. Updated: Tesla has issued the following response to a statement made by the NTSB. Just recently, the wife of the ill-fated Model X driver has gone on local news agency ABC7 News to state that her husband had complained about Autopilot multiple times before the March 23 accident. According to Mike Fong, the Huang family’s lawyer, the collision would not have happened had Autopilot not been activated. Fong noted that he would not file a complaint against Tesla while the NTSB investigation is ongoing, though he did state that the carmaker’s responses so far have been to blame the Model X’s driver. 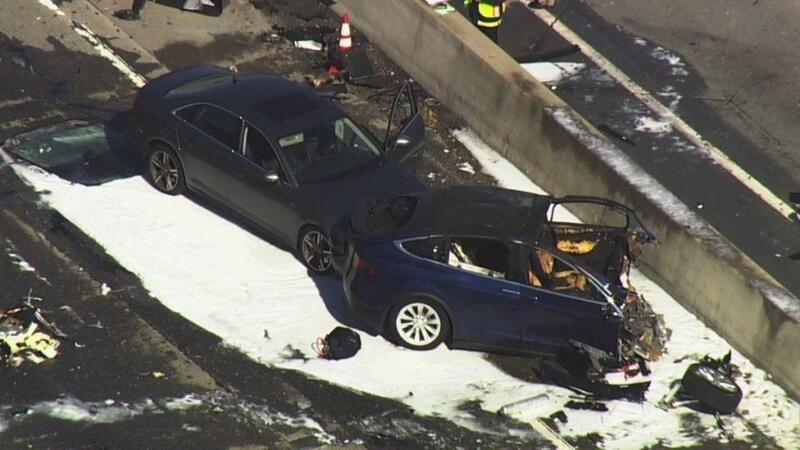 While Tesla could be facing a lawsuit from the Huang family over the fatal incident, Will Huang, the Model X driver’s brother, previously stated to ABC7 News that his brother could have survived the accident had his car collided with a working crash attenuator. During its initial update about the fatal collision, Tesla stated that the crash attenuator that the Model X smashed into had been left unrepaired, causing extensive damage to the vehicle. “That (the crash attenuator) ultimately should’ve saved my brother’s life. We’ve seen videos of similar crash(es) with cushion, and the driver walked out of it unharmed,” Will said. Later statements from CalTrans eventually revealed that the highway safety device had been damaged from a collision 11 days before the Model X accident. According to CalTrans, crash attenuators are usually repaired in 7 days or 5 business days, but storms in the area prevented any repair work.